Over 70 visitors arrived in Warracknabeal over the weekend to experience the best of our region, our country hospitality and our local produce. Organised by the Rotary Club of Warracknabeal, visitors came from the Rotary Clubs of Essendon, Wyndham, Geelong, Swan Hill ( DGE Rosanne & Peter), Horsham East, Nhill, Beaumaris, Belmont and Maryborough (DG Anthony Ohlsen & Kerrie) . Friday night was an informal Pizza Night welcome, especially for our Wyndham Rotarian friends. The Warracknabeal and Wyndham clubs have had a strong 10 year relationship, initiated by Rob deVries, who now lives in Wyndham. The city club has generously donated over $5000 towards our Warracknabeal Primary School Free Breakfast program that runs every Tuesday during the school year. The clubs have regular reciprocal social visits, and it was nice to host them for this big weekend. 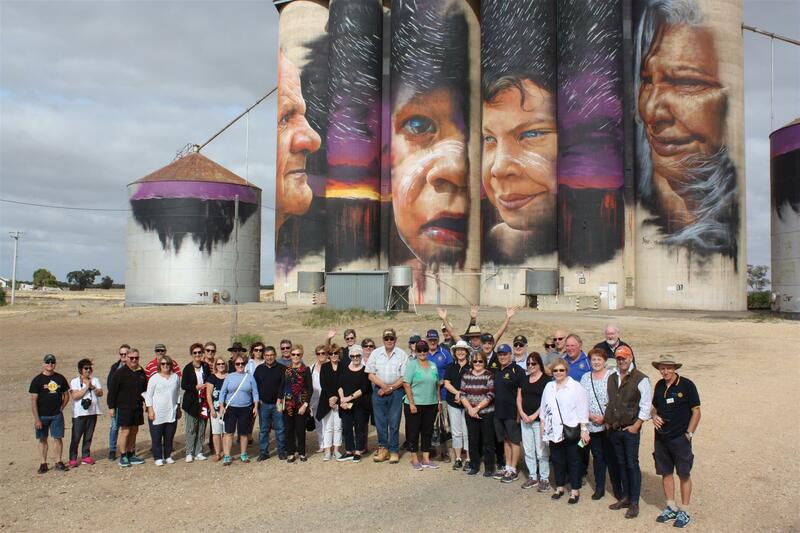 On Saturday more visiting Rotarians and friends joined us for guided tours of Warracknabeal, the famous Silo Art Trail and local farms. As this was the first farm visit for many, it was a real eye opener to see and learn of the complexity and high tech world that is farming today. Ben Bentley’s eight stand shearing shed was transformed into a restaurant for the Saturday night signature event, the Paddock to Plate dinner. Over 130 people- locals and visitors- dined in the ‘rustic meets elegant’ setting for a three course meal and entertainment. The evening began with a skilful shearing demonstration from talented young Wimmera shearers, Sean Brazendale and Josh Bone. 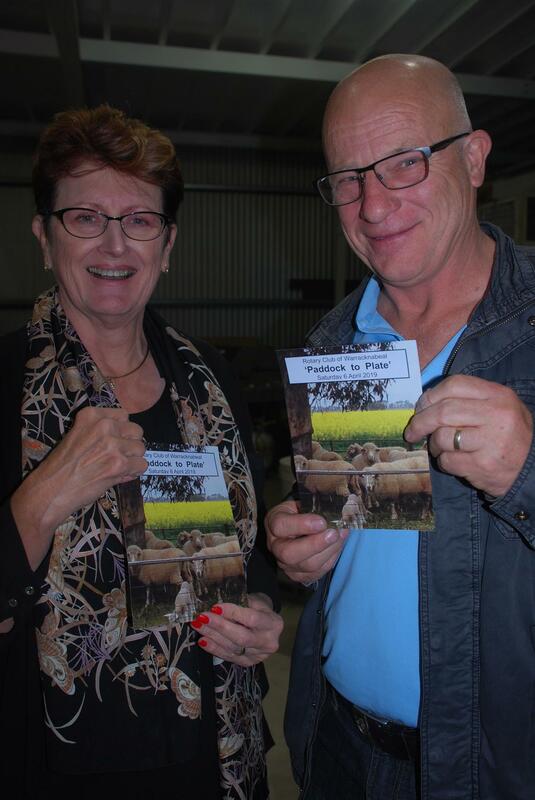 Experienced ex-shearer and Warracknabeal wool trader, Stan Deans brought the history of the great Australian wool industry to life, as he gave a very interesting and informative commentary during the shearing. Mayor Graeme Massey welcomed guests with an overview of the significant economic contribution of Yarriambiack Shire agricultural industries to Victoria and beyond. Rotary President Chris Hewitt, followed, describing our pride in living in this region, and our aim of the weekend to promote our place, people and produce. Rotarian farmer, Tony Gregson, briefly explained our grain/legume/sheep industry, and its positive future, and then described the menu chosen for the night. The meal, catered by well-regarded Digby chef, Randall Scott, featured some of our local produce-tasty lamb kofta in chick pea crumb, Saltbush lamb with chick pea, pistachio and spice stuffing, tangy lemon tart with wattle seed ice cream, were just some of the flavours. Available from ‘The Baaaaa’, you could try Sapporo beer, which uses the high quality Wimmera barley that is favoured by the Japanese brewery. Also on offer were award-winning regional wines from Norton Estate (south west of Horsham) and Bests at Great Western. 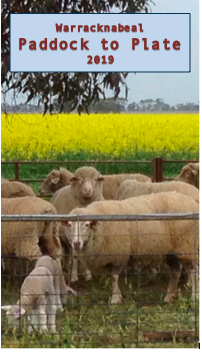 Raffle prizes of local produce were won by our Essendon visitors….taking a bit of the Wimmera with them. By the end of the night, The Rotary Clubs of Wyndham and Essendon had given $2500 towards the foundation, with pledges from the other clubs present. This is a great example of the power of a large organisation like Rotary to help to make change and improve the lives of others. Plus we meet a lot of great people and have fun while doing this. The night itself raised approximately $4000 for our club, and was hailed as a great success. Chris thanked everyone involved in organising and supporting the night. A special thank you to our sponsors–The Bentley Group, Woodbine Inc, Wimpak, Norton Estate winery, Luv a Duck. The night finished with a lot of fellowship, laughs, conversations with new friends, and listening to the talents of local musicians, John Butcher and Frosty Gunn. 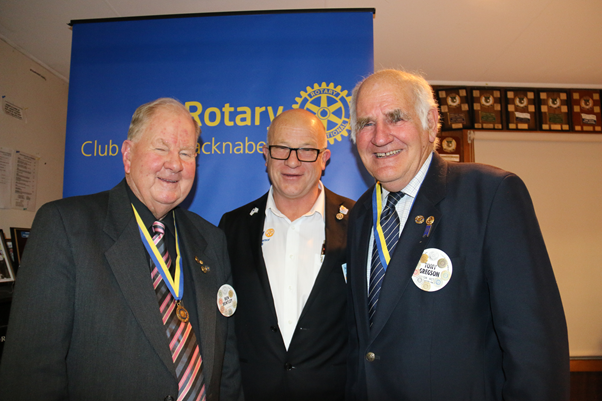 The Rotary Club of Warracknabeal have two new Rotarians. Mandy Morcom, a Nurse Practitioner at Rural Northwest Health. Many has been in many local organisations, especially when her four children were growing up. Now that they have all grown up and settled, Mandy is keen to contribute to her community in more and different ways. Megan Watts is the club's first concurrent joint Rotaract-Rotary member, and also, with her mother, Sue, has become the club's first Mother-Daughter concurrent member combination. 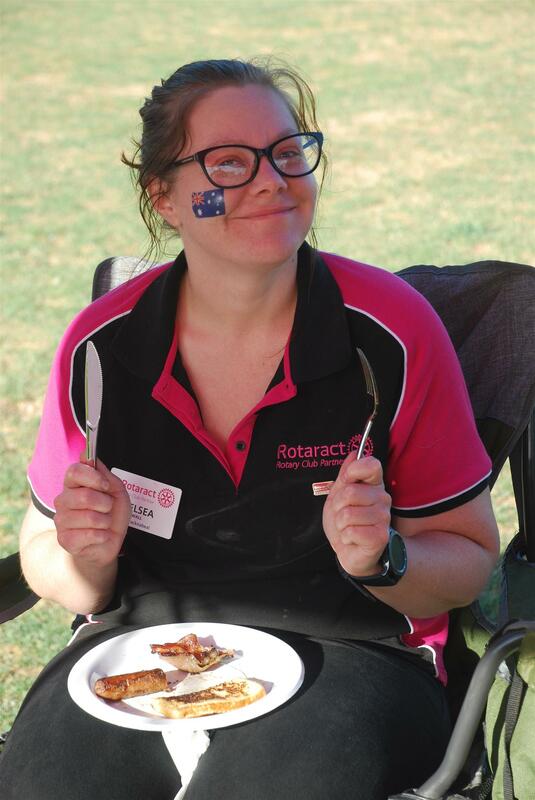 Megan has been a leader and driving force in the Rotaract Club and now wants to bring her ideas, skills and knowledge to Rotary. Megan is in Medical Administration, and enjoys sport, animals and computers. The Warracknabeal Primary School Volunteer of the year award was established in 2018 to recognise any school volunteer or group who have shown strong support to the Warracknabeal P.S. It is named in honour of long serving staff member and former school principal who has dedicated a large part of his teaching career and community life to the children, families and staff of WPS. Not only did Michael work hard during the school day he was often working hard out of hours and in the holidays and weekends for the school and the local community. It is awarded in recognition of hard work, loyal service and dedication shown to the Warracknabeal Primary School. The Rotary Club of Warracknabeal is the first group to receive this award. It is to show our deep gratitude for providing such valuable support to the students, staff and families of our school. We really appreciate all the work the Rotary volunteers put into our Breakfast Program, the school Gala Night and in the local community. We look forward to working with Rotary in the future and wish the club all the very best for the year ahead ……. from your friends at WPS. Wendy travelled from Orange, NSW, to address Rotarians, partners and key people in local government, community groups and secondary education. Guests included Shire CEO, Jessie Holmes, WSC Principal Therese Allen, WSC Acting Assistant Principal, Casey Phelan, Birchip P-12 Principal John Richmond and Birchip Cropping Group Engagement & Services Manager, Louisa Ferrier. The idea of a CEF started in Boorowa, NSW, 25 years ago when a group of community members came together to raise funds for students who couldn’t afford post-school training or further education. The idea soon spread and now there are 44 local education foundations run by more than 400 volunteers around Australia- but none in Victoria. Funding from the private sector, individual donations and corporate, philanthropic and educational partners, and bank interest have enabled the CEF to financially support nearly 5000 students with over $9 million worth of grants and scholarships. Young people from rural and remote Australia face barriers and obstacles in being able to access further education, creating significant disparity between aspiration and opportunity. “Your postcode shouldn’t determine if and where you can go for further education, or limit the career path you take” said Wendy. 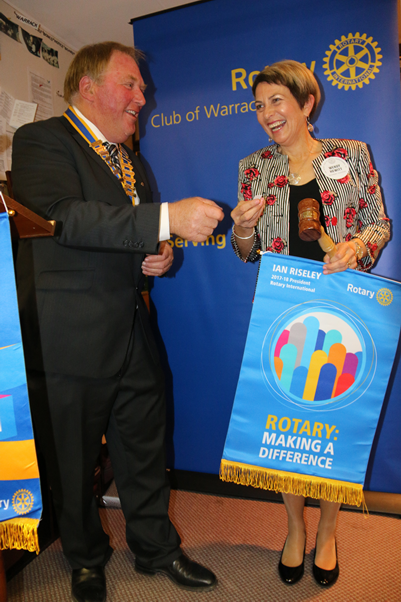 The Rotary Club of Warracknabeal is very keen to drive the establishment of such a foundation in our region, as our young people face many of the same obstacles and barriers that Wendy identified as common in rural areas. It makes sense to follow a successful model. Through associating with the CEF any new Foundation has access to assistance with governance, policies, practices and strategies for volunteers. It is a registered Not for Profit charity with Tax Deductable Gift status. The high success rate of CEF recipients completing course and finding employment in chosen fields, together with the steady growth of the CEF, are more reasons for thinking seriously about this model for our area. Thanks to President Chris for initiating the vision after being offered support for drought relief form several Rotary sources. And thanks to Tony, through his contact with CFE Ambassador, Tim Fisher AC, for following up this concept and securing Wendy to speak at our meeting. Australia Day celebrations are always a great start to the year for the Warracknabeal community. 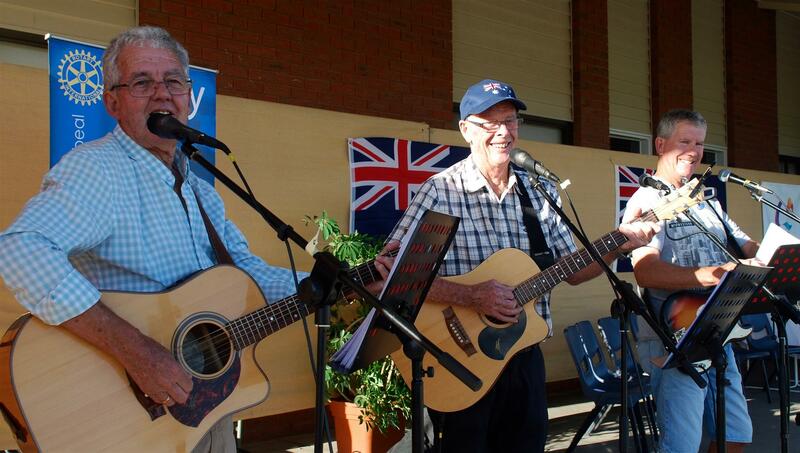 A big crowd ventured to Anzac Park on Saturday morning for a sumptuous hot breakfast cooked by the Rotary Club, while listening to the music of local trio of John Butcher, Curl Taylor and Frosty Gunn. Rotaractors had plenty for children too- games, face painting, temporary tattoos and a photo booth. When local Aero Club pilot, Phil Lienert, flew over the park, it was time for the offical proceedings to start. The Guides and Scouts' Flag Parade led the official party to the stage. President of the Rotary Club, Chris Hewitt, welcomed everyone to this occasion where we take time to celebrate our great community and country. This year's guest speaker was Rob Spicer. Rob was born in Warracknabeal and was known for his sporting prowess, particularly in swimming.... in the early days the creek was the only venue for swimming. He left school as soon as he could and went off to join the Navy. His love of swimming and the water saw him become a diver in the Navy, and in his 30s he trained to become a sea Captain. His talents and hard work saw him become a Master of some of the biggest oil tankers in the world. An inspirational story! 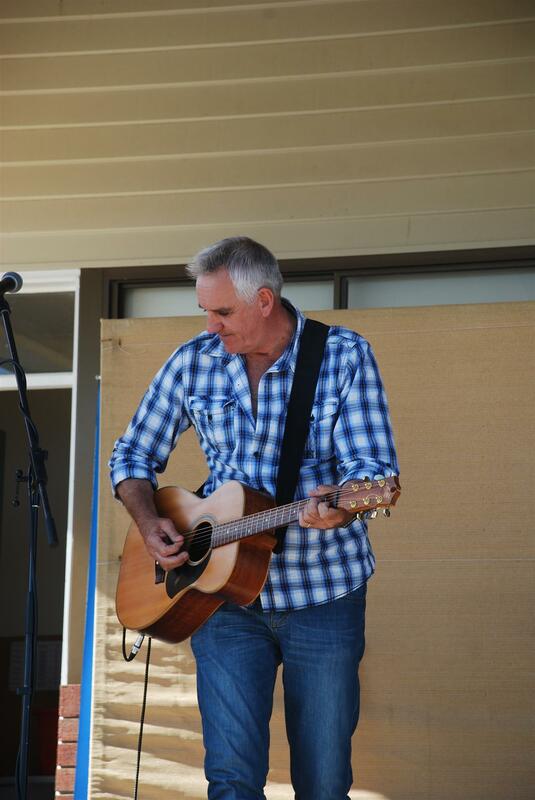 The audience was then entertained by Darryn Wardle, a talented local musician, who is back home after many years in Broome. 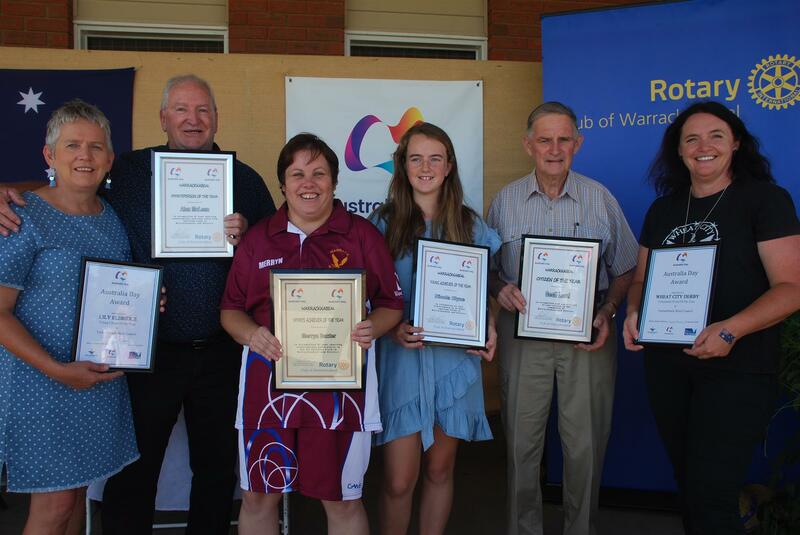 Warracknabeal and District Australia Day Awards were presented to Geoff Lovel (Citizen of the Year), Alan McLean (Sportsperson of the Year), Merryn Baxter (Sports Achiever of the Year) and Nicola Clyne (Young Achiever of the Year). Two Yarriambiack Shire award were also presented to Warracknabeal locals. Lily Eldridge was the Young Achiever of the Year, while The Wheat City Angels' Victorian Stampede won the Event of the Year. Rotary is the proud organiser of this event each year as a service to the community. This annual event, with its celebration of local stories, local talent and local contributions, perfectly reflects the Rotary International theme for 2018-19, 'Be The Inspiration'. Cr. Kylie Zanker and Will Drage, spoke about the activities of the Yarriambiack Youth Action Council in our community. This group began in 2015 with six members. In most other communities it is often extension of the school Student Representative Council, but in Yarriambiack Shire it is a ground up organisation, formed through the initiative of Murray McKenzie, the Yarriambiack Shire youth engagement officer. They meet on the 3rd Wednesday of each month. The only other youth council in the region is in Nhill. Currently the Yarriambiack Youth Action Council has 21 members aged 13 to 22. They conduct an annual youth forum with over 200 students from eight schools in the region, with speakers such as Jannik Blair, a wheelchair basketballer from Horsham who has played for the University of Missouri and in the Australian National Wheelchair basketball team. They have run or been involved with a Youth Forum, beyond blue programs targeting rural youth,Yarriambiack has Talent, Patchewollock Music Festival, the very popular Games Nights in Warracknabeal, Hopetoun and Murtoa, Camera Nights, the Ramp it, Rage it, Stage it event at the Skate Park. They have also worked with NEXUS in Horsham and been involved with Freeza. They talk about the community, sports and events on Triple H every 2nd week. Other programs include job skills programs such as car detailing, barista courses, testing and tagging, food handling and first-aid. Will Drage spoke about the skills that he had learnt, from doing the lighting at talent shows; to emceeing events and public speaking. He has found it a rewarding and enjoyable experience, and wishes to continue with the Council. Cr Kylie Zanker, who is the Shire Delegate on the Youth Council, told Rotarians the most amazing part is watching their growth, which was highlighted 3 weeks ago when one of the members was presented with the Order of Australia Central Highlands Group School Student Citizenship Award. Many Rotarians expressed surprise at the range of activities and the future opportunities for both Rotary and Rotaract to support and partner with the youth Council to provide a better community for young people in Yarriambiack Shire. Thirteen Warracknabeal Rotarians, several partners, and two Honorary Rotarians travelled to Geelong on Tuesday 4th September to participate in the celebration of Stan’s induction into Rotary 50 years ago. As well as family members and members of his home club of Geelong East, there were Rotarians representing his previous two clubs, Warracknabeal (his first club) and Beaufort, plus long time friend, Rotarian Clem Quick from the RC Beaumaris. Clubs present read out extensive lists of achievements and contributions from Stan’s 50 years of service. RC Geelong East President David presented Stan with his second Paul Harris Sapphire recognition saying Stan was probably the only Rotarian in Australia to receive this recognition from three separate Rotary Clubs. In Stan’s response he thanked Carol, his family and the many Rotarians for their support during his 50 years of service. A good crowd came to our recent Rotary gathering to hear the life story of our local member, Emma Kealy. Emma spoke of growing up in Edenhope, her journey through uni and careers in the health sector as a Medical Scientist and administrator, before becoming a parliamentarian. The values learned from her country upbringing have held her in good stead throughout her life and motivate her in whatever she does. Saturday 14th July 2018 saw the induction of new President Kelsea Wall, and her Board for 2018/2019 at a great function held at the Warracknabeal Race Club. Kelsea spoke on her hopes for a great year and congratulated outgoing President Megan Watts for her great leadership over the past 12 months. On Wednesday 4th July, Rotarians, friends and visitors witnessed the handing over of the President's Collar from outgoing President Wendy Hewitt to new President Chris Hewitt. DG Anthony Ohlsen recognising two Warracknabeal Rotarians, Ben Bentley and Tony Gregson as Paul Harris Society Members at the Changeover Dinner. Paul Harris Society recognizes Rotary members and friends of The Rotary Foundation who contribute $1,000 or more each Rotary year to the Annual Fund, PolioPlus Fund, or approved Foundation grants. (Photo courtesy of the Warracknabeal Herald)..